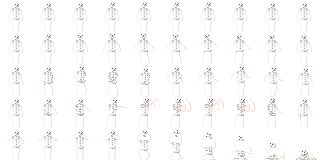 Animated Skeleton by Calciumtrice, usable under Creative Commons Attribution 3.0 license. Yep, the way CC-BY works means you can use this in your projects (including anything commercial) as long as you credit the sprites to me and ideally put a link to here or to calciumtrice.tumblr.com. Same applies to any of my other work which is CC-BY, no need to ask specific permission! Is it all right to use the head as collectible object when it's defeated. (to trow at other enemy's). Hi! I recently used this sprite in a Halloween music video I made! Thank you!